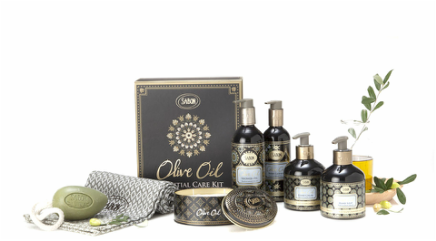 Israeli luxury bath and body brand, Sabon, has just launched the “Youth Secrets” Anti-Aging Collection and the Olive Oil Collection. Both collections aim to make aged skin look youthful again by aiding in skin regeneration, eliminating toxins and hydrating skin. All Sabon products are manufactured and packaged in Israel and consist of the finest natural ingredients. The Olive Oil collection focuses on improving the skin’s overall complexion through firming, smoothing and moisturizing. Products in the collection include body lotion, hand soap, hand cream, soap on a rope, a tin candle and a kit of miniature-sized Olive Oil Collection products. Olive tree leaf extract is infused in all products in this collection along with Jojoba Oil, Omega 7 extracts, Aloe Vera and Chamomile. The natural healing properties and abundant amount of nutrients in olive oil works to calm skin irritation, repair damage and protect skin. The Anti-Ageing Collection tends to skin on the face that has been damaged over the passage of time. Sabon’s Anti-Ageing formula smooths wrinkles, strengths dermal infrastructure, promotes muscle relaxation and brightens the appearance of skin. Products in the collection include brightening cream, face cleanser, rejuvenating eye cream, night cream and renewal serum. The Anti-Ageing Cream illuminates the face through diminishing and inhibiting the reappearance of pigmentation spots and lightening the overall completion of skin. After just one use of the face cleanser, the skin’s complexion instantly appears fresh, clean and bright. The eye cream diminishes the appearance of fine lines under eyes and on the eyelid through hydration. The Anti-Ageing night cream repairs skin overnight with hydrating and soothing ingredients. Consistent use of the night cream will visibly brighten the skin complexion and reduce the depth of all facial wrinkles. The serum is to be used daily, underneath regular face lotion in order to reach and repair deep layers of the skin. Sabon is one of the first natural skincare brands to debut an Anti-Ageing collection. Most anti-aging products are made with artificial ingredients and harsh chemicals. Sabon utilizes a blend of natural ingredients found in Israel with anti-aging properties rather than using harsh chemicals. All Sabon products are also Paraben free. The Olive Oil Collection ranges in price from $11.00-$42.00 and can be found here: http://www.sabonnyc.com/collection-1/olive-oil-1.html.